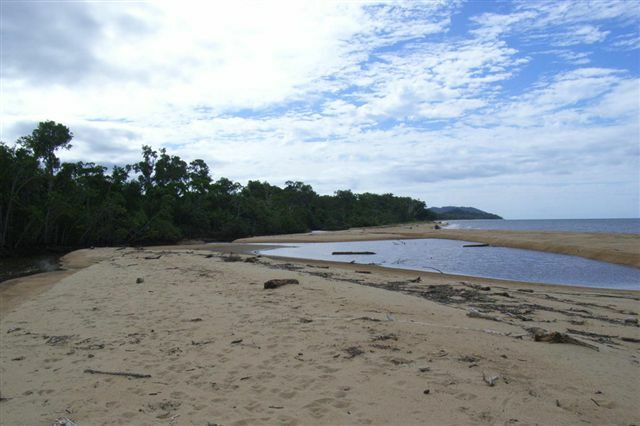 Ella Bay cassowaries use the fresh water contained within the natural lagoons that run parallel to the beach. 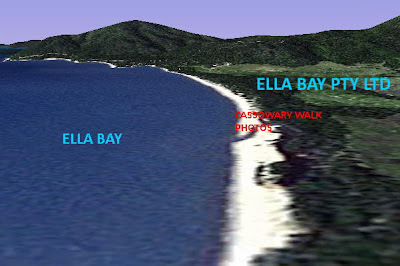 Of course they also feed from the native fruit trees that grow within this strip of coastal vegetation; native cassowary fruit trees which the proponent’s “Cassowary Assessment of the Ella Bay Integrated Resort Project” untruthfully insists are not present in this area! As humans we think of families as a mum and dad show but of course parenthood is a responsibility that falls squarely on the shoulders of the male cassowary as the female bird leaves shortly after she has mated and laid her eggs. For approximately the first 6 to 18 months of their lives the chicks are raised by their father. During this period he teaches the chicks all he can about being a cassowary and I recently bumped into some evidence of this happening at Ella Bay. 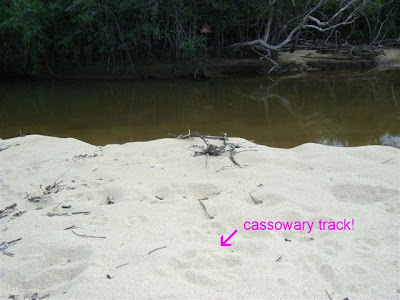 Sometimes a cassowary family has to go for a bit of a paddle if they want to access all of their territory and this story is about one such family. On Thursday 20 May 2010 I had a quick recce at Ella Bay as the following day I was taking a friend for a walk on this beach and had to make sure Barra Creek which runs out of the proponent’s property into the ocean was crossable. Of course this creek can flow pretty heavily during the wet season as the following video will illustrate. When I arrived at the creek it was flowing into the ocean quite steadily and could be easily crossed. 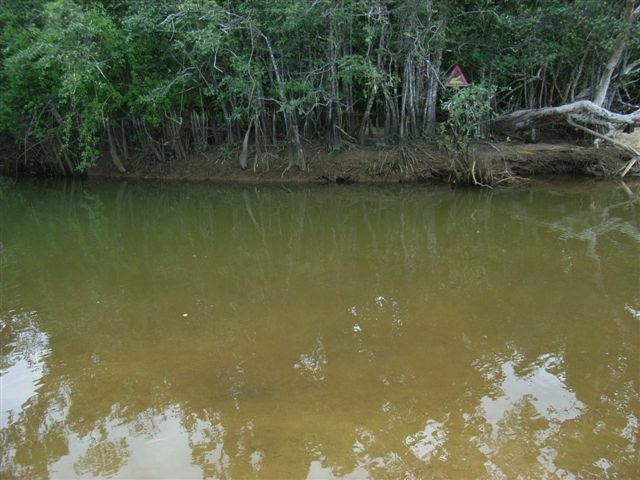 Note the crocodile warning sign …it's there for a reason! 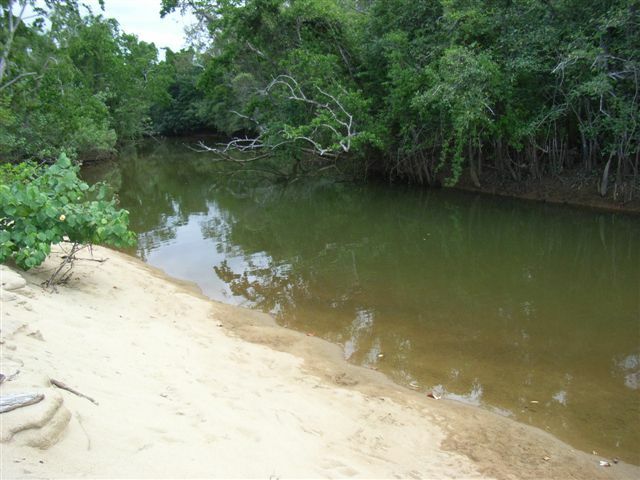 Then check out Green Turtles, Crocodiles and Ella Bay as the Crocodile tracks in this story were going into this same creek just metres from where this story begins. 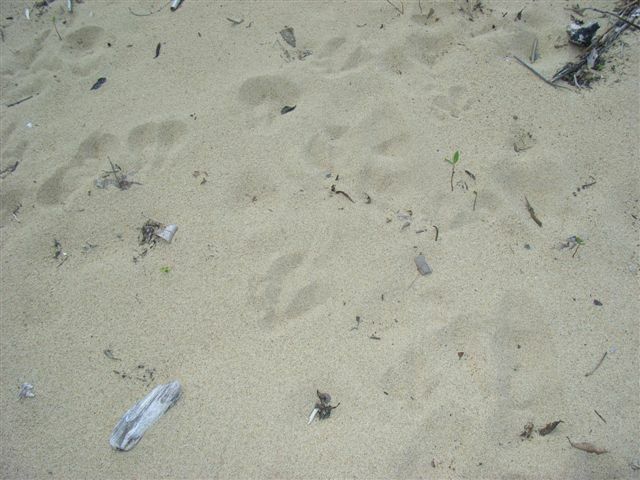 On the way back I noticed two sets of Cassowary tracks in the moist sand. I followed the tracks and came to the spot where the adult male cassowary had crossed the creek. I could see the tracks where the adult male had shook the water out of his feathers after crossing the creek and had shuffled his feet around to keep his balance as he did so. 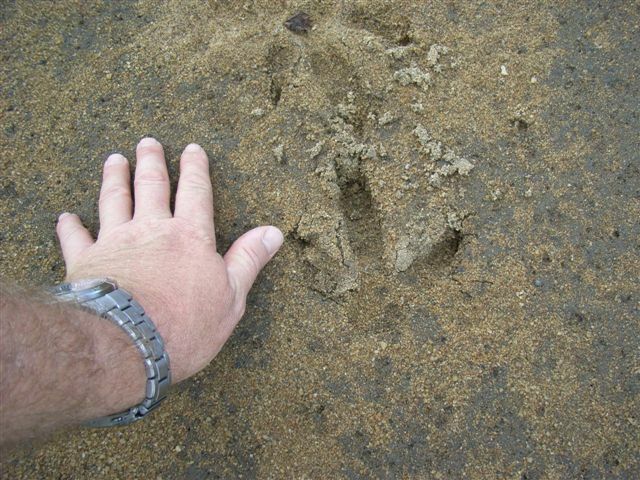 I noticed the smaller tracks of a juvenile cassowary traveling with the big male bird. As you will see below dad has a much bigger foot. And here is a shot of the two birds tracks together. 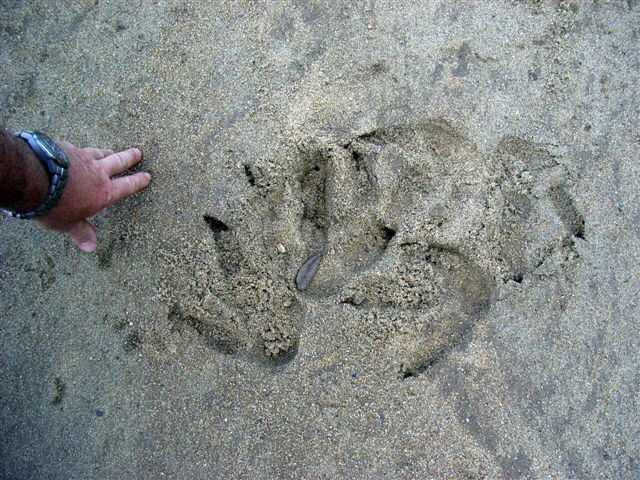 I followed the two tracks south. 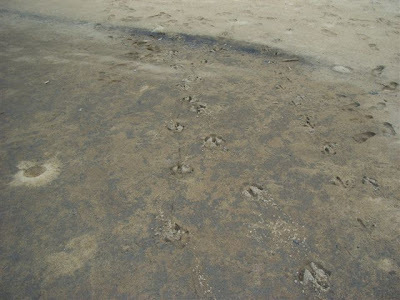 They were easy to follow in the moist sand. Although they did do a bit of zigging and zagging along the way! Looking behind me it looks like the area where the tracks were was near the old creek mouth, this year’s creek mouth is further north. 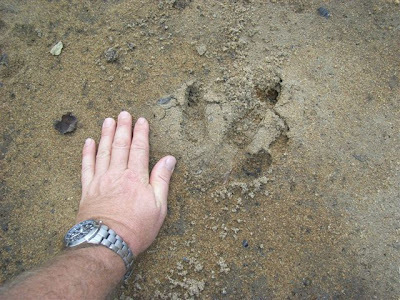 In the drier sand away from the creek the tracks were less obvious and by the following day they were almost gone. To my embarrassment I noted I had walked straight past them on my journey to the creek! 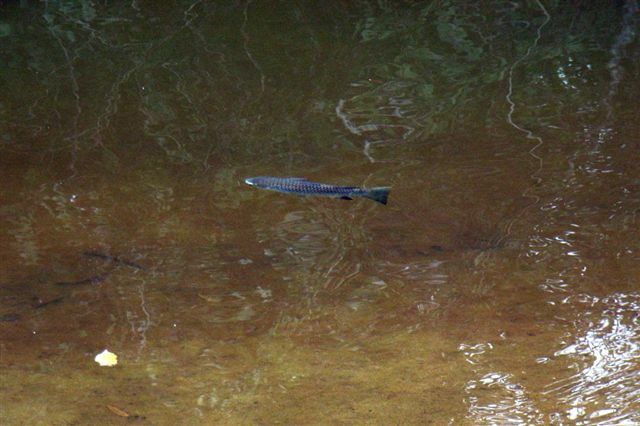 I was distracted for a few moments by the big diamond scale mullet that were swimming in the creek. Eventually the tracks disappeared into the coastal scrub and I continued my journey home. 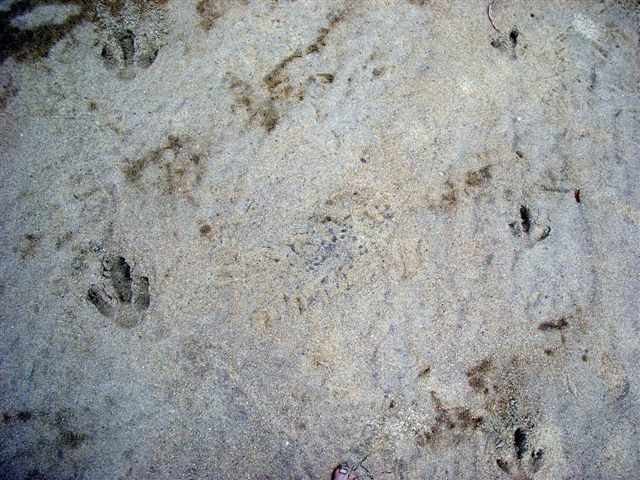 On the way back I saw a Beach stone curlew which is of course listed as a vulnerable species in Queensland. I had seen this bird on the way to the creek of course! Keep looking.... it's there I promise! 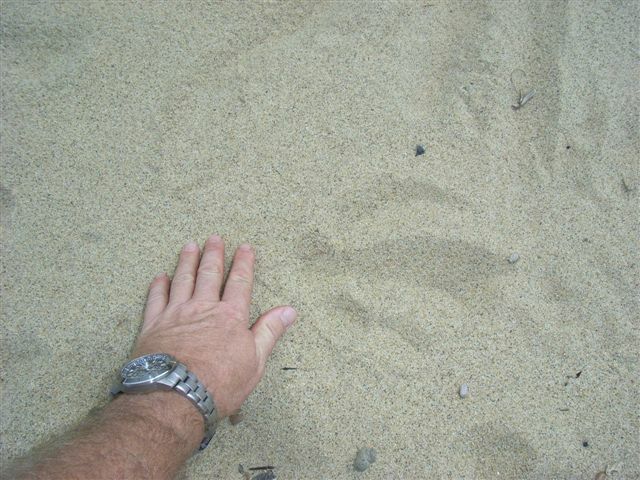 It was interesting to get home and look at the cassowary tracks and maps on the computer as they illustrated just how mobile the mouth of Barra Creek is. When the gps data was moved into Google earth it shows the creek mouth was much further south on the old google map than it is today. Now of course it is above the top pin on the above map. 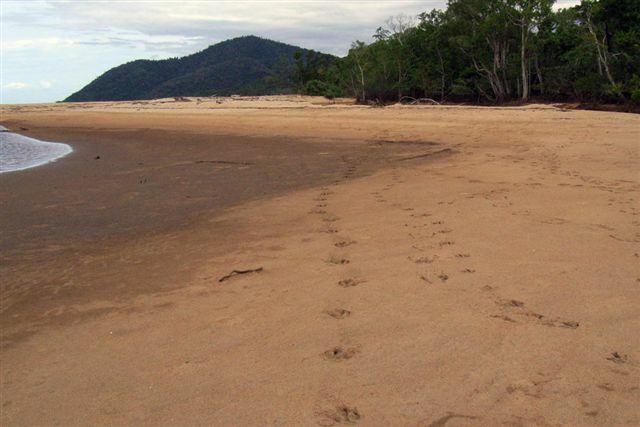 I just looked over this story and realised it wasn’t really fair to have a story about beach cassowaries that didn’t contain a photo of an Ella Bay cassowary on the beach! 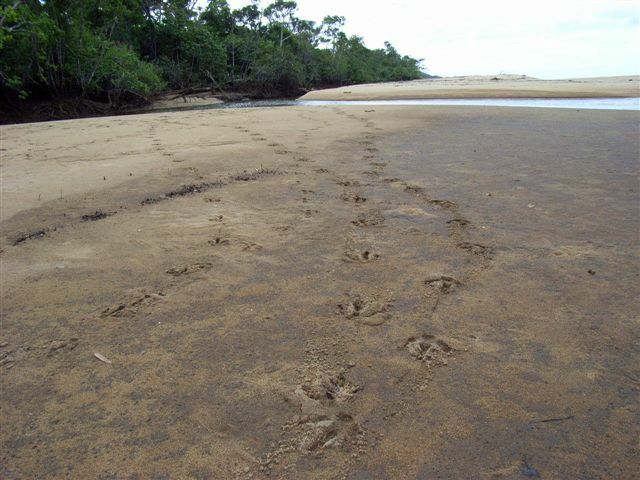 So here's a photo of an Ella Bay Cassowary walking. And eating Beach almond fruit! Here’s a short video of a recent meeting I had with an Ella Bay cassowary in the dunes! Russell, it was worth the wait! LOL. I never ever get sick of seeing the cassowary. And the video!! oh what a treat! Thank you! Thank you so much for your encouraging comments Amanda. 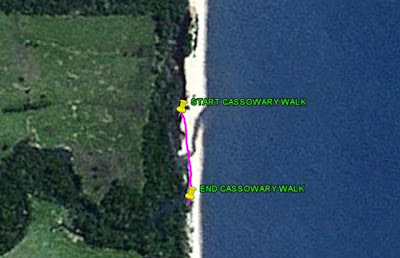 I have a few more stories about cassowaries accessing beach side food plants and crossing the Ella Bay road to do so. I will attempt to post them in the near future! I mentioned to "Mick" (not her real name) that she ought be in contact with you about the issue of cars on beaches. Such a stupid idea. 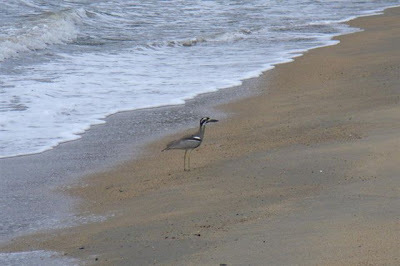 Loved the first shot of the Beach Stone Curlew. Couldn't see it amongst the drift wood. Decided to take your word for it. I assume you have sent your photos and video to the relevant authorities who need to review the DA for the future resort. Sorry I should have explained. She does read your Blog, of course. 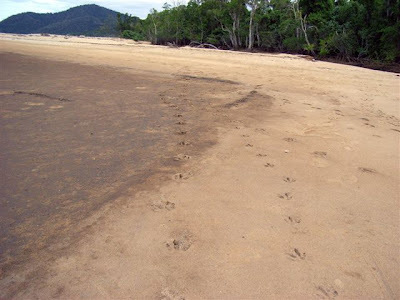 The cassowaries probably enjoy a nice long quiet walk along the beach --- just like us! Thanks for your comments Denis and if you look closely at the timber in the mid lower centre of the screen you will see the Beach stone curlew amongst the timber facing the ocean! I have visited Mick's site in the past and she takes some wicked bird photos that's for sure. 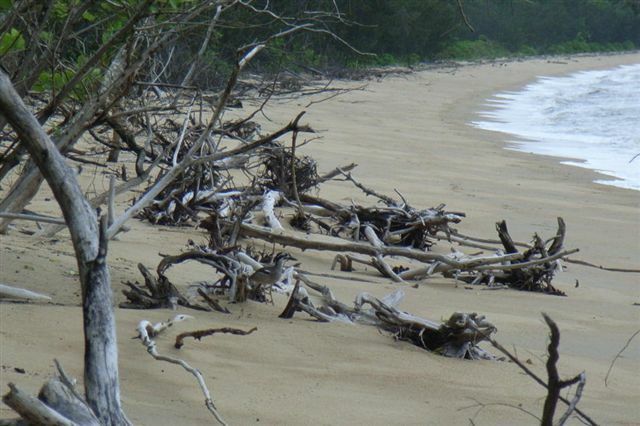 Beach driving is a cancer on our beaches and North Queensland councils and NRM authorities need to learn from the mistakes that have been made in South Queensland before it's too late. It's a crazy situation when you visit Cowley beach and can't lie back and relax as people can lawfully drive a vehicle at 100 km/h along this short stretch of beach(southern section is a little over 1 kilometre long). As I have said in the past I don't build sand castles on the pacific highway so why are the authorities allowing our beautiful beaches to be turned into race tracks? 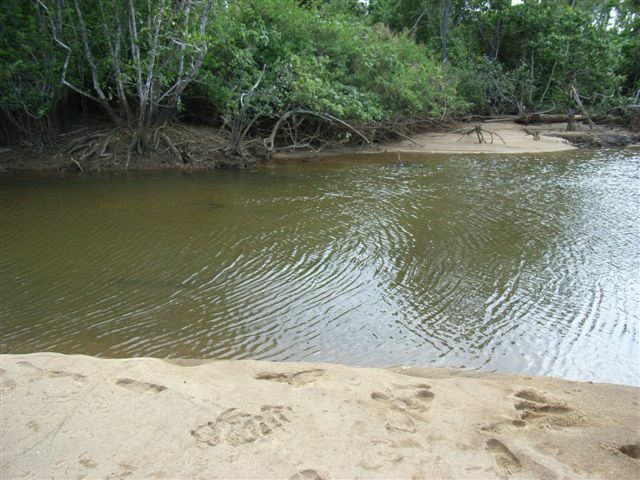 I agree snail and they are also accessing the fresh water in the lagoons and hundreds of fruit trees that grow just metres from the beach too! That's not to say a dip in the creek and a beach walk isn't something most cassowaries would enjoy! Loved your latest pademelon photos...very nice... almost as good as some of your terrific tree kangaroo photos! 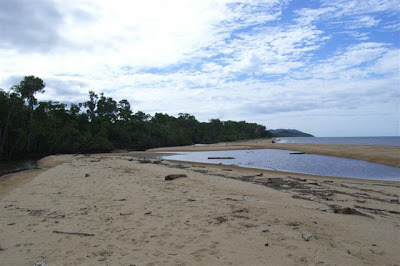 This blog features some of the amazing flora and fauna of Ella Bay and Bramston Beach, and highlights conservation issues within the region. More about how I got interested in Ella Bay in this post.